Proposition 6 is a constitutional amendment ballot initiative that qualified for the November 2018 General Election. Prop 6 requires that the statewide electorate approve any gas, diesel, or vehicle related tax or fee increase. Since the initiative has a retroactive effective date of January 1, 2017, it would repeal the revenue increases included in Senate Bill 1 – the Road Repair and Accountability Act of 2017 and potentially impact other long-standing transportation funds. If Proposition 6 passes, approximately $5 billion in annual transportation revenue for local streets, state highways, and public transportation would be eliminated. FLORENCE-FIRESTONE, CALIF.—A $1.5 million project funded by California’s Senate Bill 1 (SB1) revenues has paved the way for four miles of safer, smoother roads in Florence-Firestone. "Walkability and traffic safety are key priorities for the Florence-Firestone community," said Los Angeles County Supervisor Mark Ridley-Thomas. "The County was able to address both issues using SB 1 funding to rehabilitate residential streets, curbs and gutters that had begun to deteriorate over years of heavy use." "The repairs have extended the useful life of local roadways, resulting in an easier commute, enhanced walkability and safer streets for local families," he said. In response to the need for infrastructure repair across the state, Governor Jerry Brown signed Senate Bill 1 in April 2017, providing transportation funding to local and state infrastructure agencies. SB 1 raised the state's gas tax and vehicle registration fees to generate revenue for transportation infrastructure projects. Pavement repairs were made in close coordination with an ongoing project, funded by grants awarded by Metro and Caltrans, that will install new bike and active transportation infrastructure, including bike lanes, traffic circles and pavement markings along Crockett Boulevard, Maie Avenue, Miramonte Boulevard and 68th Street. The new bike lanes and facilities will help provide connectivity to the Florence Metro Blue Line Station, existing bike lanes on Compton Avenue and enhanced facilities along a Suggested Route to School for students attending Miramonte Elementary School. The result is a neighborhood with enhanced active transportation opportunities and safer streets for local families. EAST LOS ANGELES—A $2.7 million project funded by California’s Senate Bill 1 (SB1) revenues has paved the way for seven miles of safer, smoother roads in East Los Angeles. The project brought much-needed life support to residential streets, curbs and gutters that had begun to deteriorate within the unincorporated community over years of heavy use. The repairs will extend the useful life of local roadways by six to eight years, resulting in an easier commute, enhanced walkability and safer streets for local families. With easy access to the East Los Angeles Civic Center via the Metro Gold Line and the County’s El Sol shuttle, the community’s local roadways provide residents with direct access to regional transportation hubs and a variety of County services. In response to the need for infrastructure repair across the state, Governor Jerry Brown signed SB 1 in April 2017, providing transportation funding to local and state infrastructure agencies. SB 1 raised the state's gas tax and vehicle registration fees to generate revenue for transportation infrastructure projects. 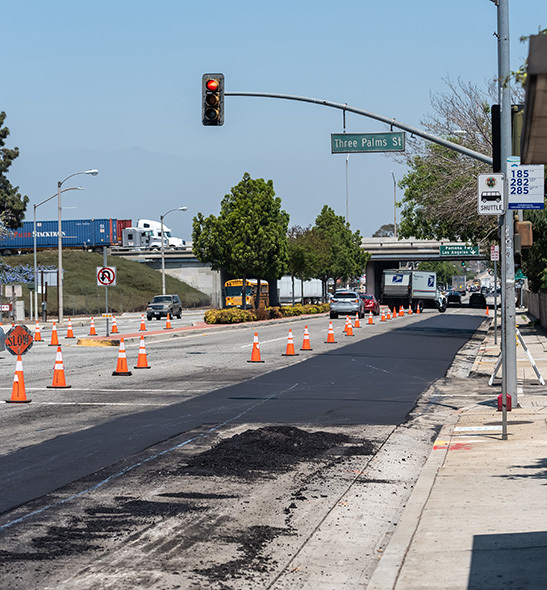 "Once additional revenue was made available, the County quickly identified roads in need of repair," said Los Angeles County Supervisor Hilda L. Solis. "The freshly-paved streets in East LA have decreased the risk of pothole damage to cars, reduced noise pollution from vehicles driving over faulty pavement and provided numerous benefits to motorists, bicyclists and pedestrians who travel them daily. Pavement repair to East LA’s residential streets was done in close coordination with a second road construction project that is currently underway. That project was funded by grants from Metro and Caltrans and will install new bike and active transportation infrastructure, including bike lanes, traffic circles and pavement markings along Mednik Avenue, Arizona Avenue, Ford Boulevard, Rowan Avenue and a bike signal to facilitate crossings on the Woods Avenue Bicycle Boulevard. A $1.2 million project which repaired and repaved nearly nine miles of roadway was completed recently in Hillgrove, a neighborhood in Hacienda Heights. For local residents, the repairs provide welcome relief from years of deteriorated roads and broken curbs. In response to the need for infrastructure repair across the state, the California Legislature passed SB 1, which brought much-needed transportation funding. SB 1 raised the state's gas tax and vehicle registration fees to generate revenue for transportation infrastructure projects. The County quickly identified streets within Hillgrove that were in most urgent need of repair. The funds were used to repair road pavement, mend broken curbs and gutters and install new curb ramps at multiple intersections. The result was a neighborhood with enhanced walkability and safer streets for local families. $93 million annually in the Road Maintenance and Rehabilitation Account (RMRA) for “Fix-it-First” road maintenance, repair and safety projects. $44 million annually to supplement the County’s ongoing operation, maintenance and traffic safety programs that are critical to the daily quality of life in our unincorporated communities. Equivalent to about first two years of RMRA revenue. Fiscal Year 2018–19 SB 1 revenue will be reduced from $110 million to $37 million. Total Fiscal Year 2018–19 SB 1 and other gas tax revenue will be reduced from $280 million to $207 million. Except for non-discretionary safety projects, all unfunded projects will have to be suspended. Ongoing gas tax revenue will revert back to an estimated base of about $170 million annually. With ongoing operation and maintenance expenses of about $234 million. Public Works is examining contingency alternatives for the Road Fund for allocation of limited funding among operations and maintenance, and for improvement and safety projects.